When you enter into the interiors of West Bengal during the monsoons, you pass through the most stunning landscapes – vast expanses of green stretching out into the distance; pulsating with life, washed afresh in the abundant rains. The clouds hover grey and black over the horizon. And you look mesmerized, at the visual spectacle that only Nature can orchestrate. Medinipur is a district on the southern fringes of West Bengal. 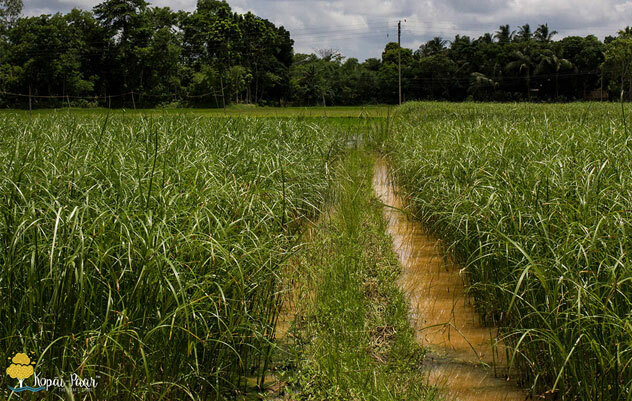 As in most of Bengal, the principal crop which grows here is rice. Paddy fields line both sides of the narrow winding village roads. 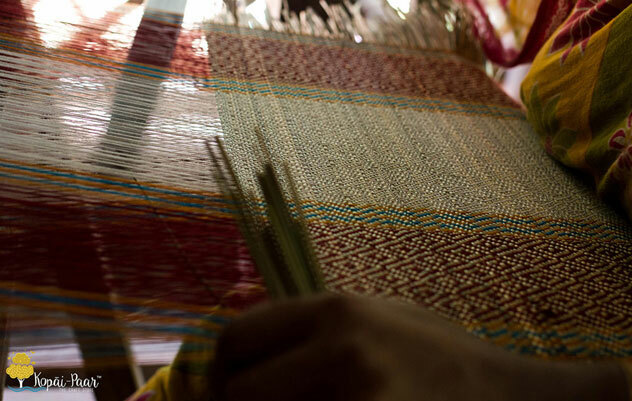 Apart from farming, the other important source of income for the villagers of this region is Madur Kathi weaving. Madur Kathia rhizome based plant (Cyperus Corymbosus) is a natural fibre which grows here in abundant quantities& found in alluvial tracts of Purba and Paschim Medinipur. 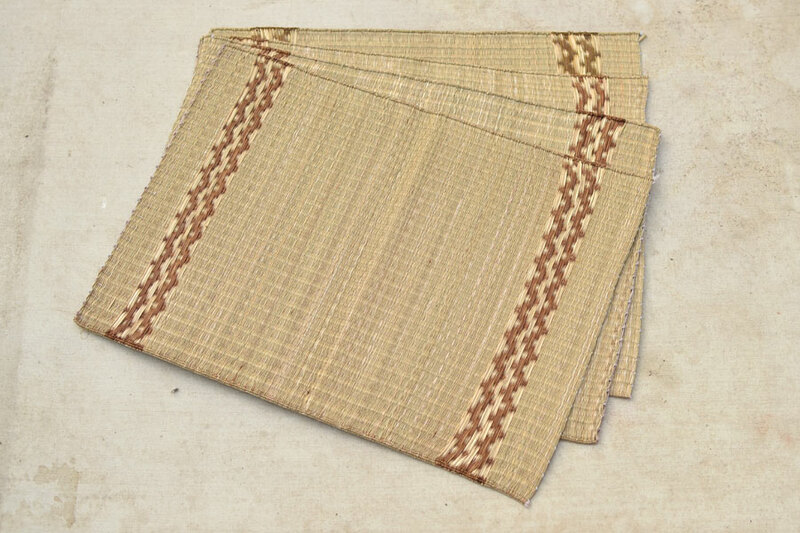 Madur Kathi reeds are cultivated for weaving when the reeds reach a height of approximately five feet, they are cut, dried in the sun, split into thinner strips and seasoned to make them strong and durable for weaving. 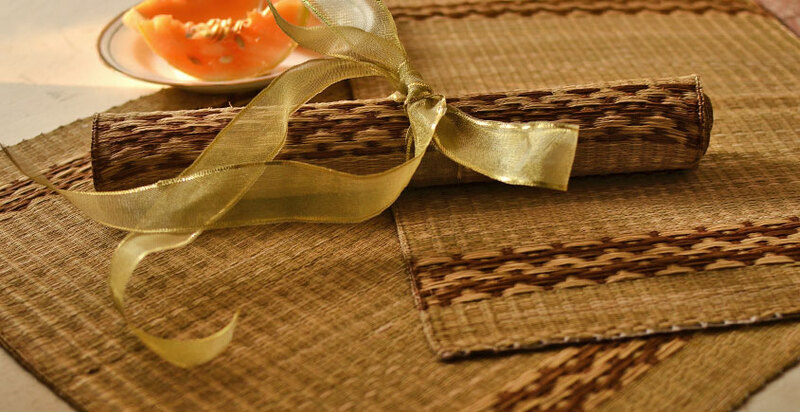 Traditionally, Madur Kathi was used to make Masland mats, which refer to very fine reed mats woven with silk threads. They are so soft to the touch, that they could pass for fabric. Mention of these luxurious mats can be traced back to the Mahabharata. 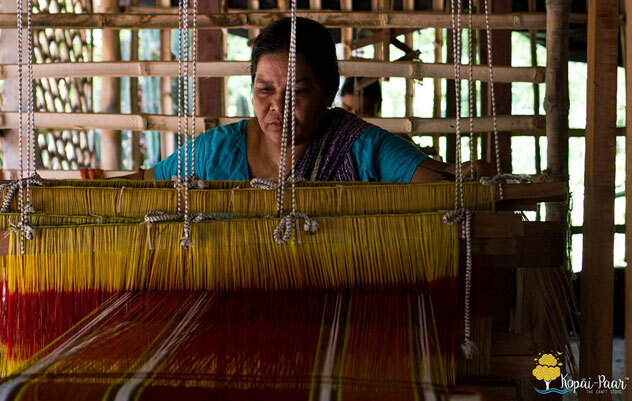 The artisans would create elaborate patterns on the mats and one fine Masland would take months to weave. 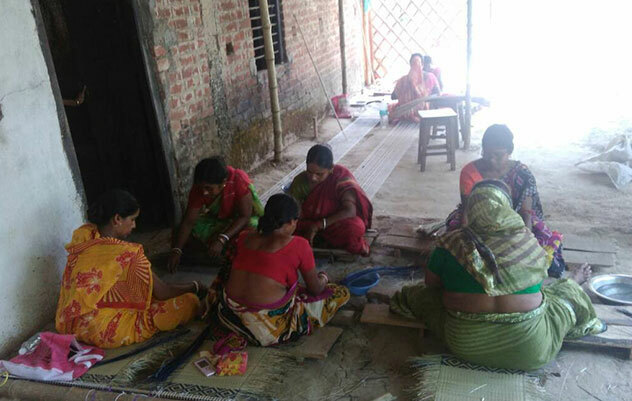 But today, there are very few weavers who can weave fine Masland, and there is very little demand for these expensive mats. Due to the effects of commercialisation of the craft, hand-looms are now used to speed up the process. The mats are woven on the loom using coloured threads. Most of the village women practice the craft which has been in their family for generations, and almost every house will have a loom or two. It forms an important supplement to their meagre family income. The process begins with the collection of the raw materials. The reeds are dried, spliced and split into fine strands using a knife or teeth. 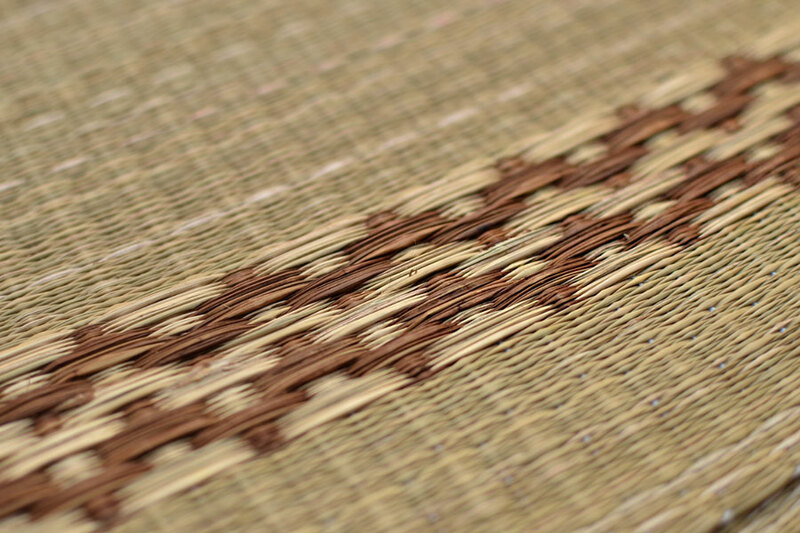 It is then, soaked in water and dyed in natural colors before woven on a simple frame loom. The mats are unique because it takes two weavers to weave at a time. The popular design on Masland mats are of flowers, honey comb (mouchak), Rhomboidal (barfi), cascading (jharna) etc. Besides making folding mats, these units have diversified into making various utility items and accessories such as bags, folders, table mats, runners, coasters, boxes etc. 93% of the mat weavers are women. 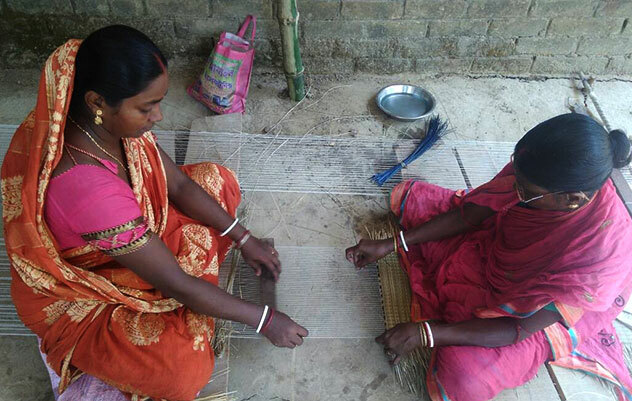 The women of the households spend their leisure time weaving mats.